Spending time in wet areas – for example the daily shower or going to the pool – is a challenge for many amputees: moisture and slippery floors increase the risk of falling, walking devices do not provide sufficient safety and the visual appearance should be as inconspicuous as possible. 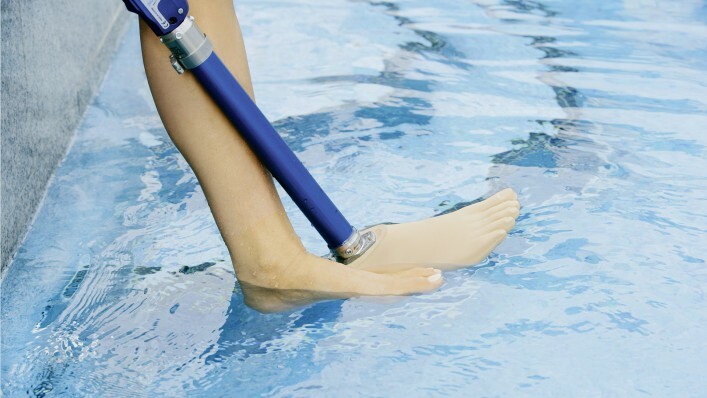 The Aqualine prosthesis system is specifically designed to meet the requirements of wet areas. The Aqua-Foot features a high degree of anti-slip functionality, and the integrated lock of the Aqua-Knee provides an additional level of safety for standing and walking. 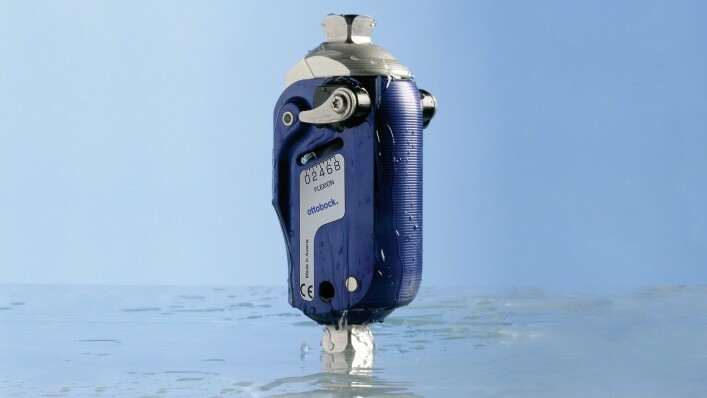 Numerous additional prosthetic components and connecting elements are available that allow the orthopaedic technician to fabricate a high-quality, custom waterproof walking device. The special Aqualine Cover ensures a less conspicuous and more natural appearance. 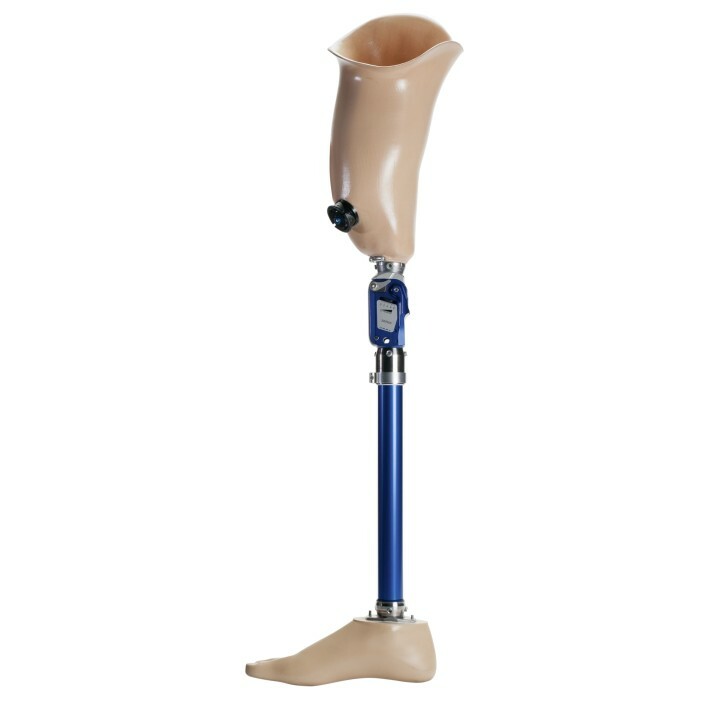 Various prosthetic components and connecting elements are available, allowing your orthopaedic technician to fabricate a high-quality, custom waterproof prosthesis, for example with the Aqua knee and the Aqua foot. The abducted big toe of the Aqua foot allows you to wear thongs or flip-flops. The cover is designed especially for use with the Aqua foot and the Aqua knee, giving your prosthesis a natural appearance. You can easily put it on and take it off yourself, making it straightforward to clean. 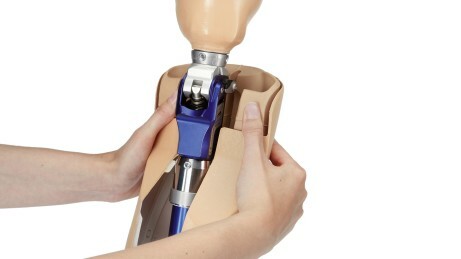 You can easily operate the lock lever of the Aqua knee in order to lock the knee joint. 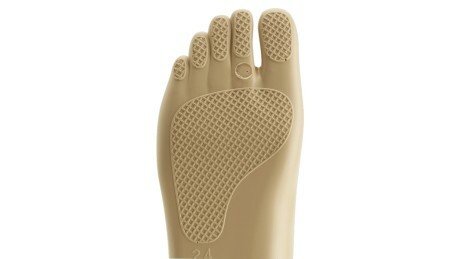 The special design and material composition of the Aqua foot ensures very good traction on wet surfaces. In order to avoid slipping in wet areas, amputees just like non-amputees have to move with suitable speed. The sole of the Aqua foot is highly slip-resistant. The special material composition and shape ensure very good traction. Your safety is the top priority. This is why measures for standing safely are of special importance in wet areas. You can easily lock and unlock the Aqua knee for activities in and around water thanks to an integrated locking mechanism. Swimwear exposes the prosthesis. High expectations are therefore placed on appearance. The Aqualine cover looks very natural. It is available in various standard sizes and the length is individually adapted by the orthopaedic technician. The coating is available in various colours. It is waterproof and makes the cover look attractive. Your prosthesis is flooded when you enter the water. After you leave the pool, the water drains back out through small openings in the components. You can easily clean your bathing prosthesis with fresh water. All prosthesis components are resistant to water and corrosion. Contact with chlorine, salt water or soap is not damaging with adequate care. Waterproof walking aids are covered by compulsory health insurance. There is a legal right to a bathing prosthesis in addition to the walking prosthesis. This was decided by the Federal Social Court. The Aqua foot has an abducted big toe. This allows you to comfortably wear flip-flops or thongs at the beach or pool. In three appeal proceedings, the German Federal Social Court decided on the question of whether compulsory health insurance had to supply a leg amputee with a waterproof prosthesis in addition to the walking prosthesis. The right to be fitted with a waterproof prosthesis, also known as a bathing or swimming prosthesis, was categorically affirmed by the deciding Senate. The use of a waterproof walking device is necessary in order to allow for safe walking and standing in wet areas. The water-resistant, monocentric Aqua knee is very compact and lightweight. Thanks to miniature hydraulics, the swing phase can be adjusted by your technician to meet your individual needs. You can also lock the joint using an additional integrated locking mechanism, which you can easily operate using a lock lever. This gives you additional safety while standing and walking when you need it. The special shape and the composition of materials give you a better footing on wet and slippery floors. Various corrosion-resistant adapters are available to connect the Aqua knee, Aqua foot and socket, and also for socket design – from the PushValve exhaust valve to the liner fitting. Who can wear an Aqualine prosthesis system? If you are a transfemoral or transtibial amputee, you can be fitted with the Aqualine prosthesis system. It is approved for a body weight up to 150 kg. You can for example take a shower or go to the pool without any problems with the Aqualine prosthesis system. All components of the system are designed for the special requirements of wet areas, and are therefore waterproof. Afterwards you can clean your prosthesis system quickly and easily with water. What level of safety is offered by the Aqualine? Various features contribute to enhanced safety, ranging from the non-slip sole to the ability to lock the joint. However, a suitable walking speed is always important – for anyone moving about in wet areas. Does my health insurance cover the cost of the Aqualine? In several court decisions, prosthesis wearers were granted a prosthetic fitting for wet areas in addition to their walking prosthesis.